A comparative genomic analysis identified a highly homologous genetic region among actinobacteria. 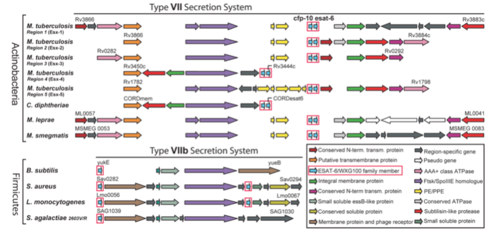 The gene products of this region assemble a novel secretion system called Type-VII secretion system (T7SS). In the centre of this region, there are two genes encoding for ESAT-6 and CFP-10 on one operon. Both CFP‑10 and ESAT-6 are small proteins of approximately 100 amino acids that belong to the WXG100 protein superfamily.